Family owned since 1917, Perlick’s award-winning, luxury residential product line features innovative indoor and outdoor undercounter refrigerators, wine reserves, freezers, freezer and refrigerated drawers, ice makers, and beer dispensers. Every product features the same unparallelled design and meticulous craftsmanship that Perlick's commercial bar/beverage equipment and beer dispensing system does - which is why our products are trusted by the finest restaurants, bars, hotels, resorts, stadiums and arenas around the world. When every element matters in your designer kitchens and bath, choose Everpure. Everpure has grown to become recognized as a worldwide leader in quality, reliability and innovation, with facilities across the globe. While our water filtration systems protect the water of national restaurant chains worldwide, the water we care most about is yours. Founded in 1933 by C.B. Oliver, who wanted to provide clean drinking water for his family and friends, our commitment to you is ensuring every glass of water you drink is sparkling clear. Enhance the benefits of a tap water with a sleek, undercounter drinking water system. 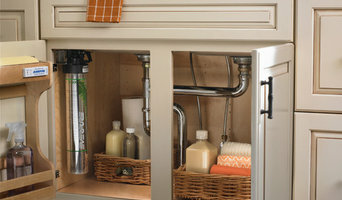 Our systems boast a sleek, slim aluminum canister that easily complements any designer kitchen or bath. Unfiltered tap water may contain a wide variety of contaminants, such as lead, asbestos and giardia, which can pose serious health risks. Home drinking water filtration systems are an effective and efficient way to remove these contaminants so your family can enjoy quality drinking water and peace of mind, knowing there is minimal environmental impact and your water is clean. Everpure offers a wide range of water filtration systems, each certified by the world's leading third-party testing agencies, like NSF, to provide the highest quality drinking water with our exclusive Micro-Pure technology. Discover peace of mind with Everpure. For over five decades, U-Line continues to be the American leader in innovation, quality and performance in the premium built-in modular ice making, refrigeration and wine preservation market. 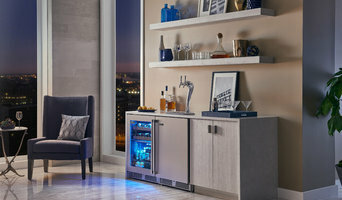 Delivering versatility and flexibility for multiple applications including residential, outdoor, and marine use, U-Line’s complete product collection includes Wine Captain® Models, Beverage Centers, Clear Ice Machines, Crescent Ice Makers, Glass & Solid Door Refrigerators, Drawer Models, Freezers, and Combo® Models. U-Line offers the right product, in the right place, at the right temperature. U-Line is headquartered in Milwaukee, Wisconsin. For more information on U-Line products visit u-line.com. BEST® is a leading designer of luxury range hoods. Known for using Italian design to inspire our wide variety of range hood styles, BEST combines the broatest choices in design and technology to ensure you have the power and performance your cooking style demands. Live Beautifully with BEST range hoods. DIY Decor Store is the online store for ACP home decor products. Our brands include Fasade, Aspect, Genesis and others geared toward the DIY homeowner. -Earned my Appliance Technician Degree from Milwaukee Area Technical College (MATC). -Federal & State Certified in Appliance Repair. -Over 6 years experience in the field. -No price mark up on parts! -No trip charge for on site repairs! -No overhead! Welcome to our Wauwatosa site. To learn more about Grand Appliance and TV and the kind of work that we do, please visit us at <a rel="nofollow" target="_blank" href="http://www.houzz.com/pro/grandzion/grand-appliance-and-tv">http://www.houzz.com/pro/grandzion/grand-appliance-and-tv</a>. Our mission is to bring together all the world's finest kitchen appliances and specialty kitchen products in one beautiful, spacious showroom; add the most knowledgeable, friendly, and experienced sales staff in Milwaukee; and offer highly competitive pricing and service after the sale. Appliance Gallery provides a thoroughly enjoyable personal shopping experience and world-class kitchen appliances for homeowners and home remodelers. 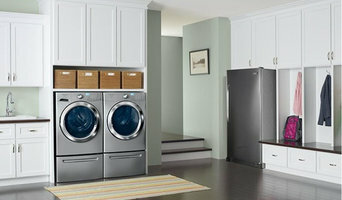 In-home appliance repair servicing washers, dryer, dishwasher, refrigerators and ranges. Kissinger Appliance & TV is your home for new and used appliances and TV's for your home. Stop by our store, located at 700 N Wisconsin Street in Port Washington, Wisconsin to view our showroom. Visit our website for store hours and directions. Mr. Appliance® is North America's leading home and commercial appliance repair franchise system. Established in 1996, its franchises provide full-service home appliance repair and light commercial appliance repair services. Mr. Appliance has more than 150 locations throughout the United States and Canada and is consistently ranked among the top home service franchises by Entrepreneur magazine and other industry experts. Mr. Appliance is a subsidiary of The Dwyer Group, Inc., a worldwide franchise holding corporation supporting more than 1,100 franchisees in the United States and 24 foreign countries. In addition to Mr. Appliance, other Dwyer Group subsidiaries include: Aire Serv® Heating and Air Conditioning, Glass Doctor®, Mr. Electric®, Mr. Rooter®, The Grounds Guys™, Rainbow International® Restoration and Cleaning, and Five Star Painting®. The businesses are diverse, but all are built upon the same philosophy of success - exceed the customer's expectations. Established in 2003, Heaven Fresh is a privately owned Canada based firm with its head office in Toronto, with its aim to provide quality products to maintain a healthy, fresher and pure indoor environment. Due to global warming, awareness about water and air pollution, the need for indoor air purifiers has become all the more important. Heaven Fresh is committed to provide quality electronic Ionic Air Purifiers for a better healthy environment. Our state-of-the-art products include the Ionic air and water Purifiers, Humidifiers, Household appliances. These indoor products are available on line in USA. Our major retailers include Best Buy, Wal-Mart, Sears.com, buy.com, bed bath & beyond etc. Since its inception in 2003, the company has established its major business in the USA, Canada, UK, Germany and the UAE. Local offices also export Heaven Fresh articles to neighboring countries through independent dealers. Your Wisconsin appliance professional might handle any or all of the following jobs: selling, installing, repairing and upgrading both small and large appliances. He or she can advise you on the right equipment for your Gibbsville, WI home, from features to finishes, and is usually in the know about the latest technological advances and bells and whistles. When appliances hit a snag or start to show their age, a pro can advise you whether to repair or replace them, then carry out his or her recommendation. Some appliance professionals work closely with Gibbsville, WI builders, remodeling contractors, and kitchen and bath designers, among others. Here are some related professionals and vendors to complement the work of appliances: Kitchen & Bath Fixtures, Kitchen & Bath Designers, Kitchen & Bath Remodelers, Specialty Contractors, General Contractors. Find an appliance professional on Houzz. Narrow your search in the Professionals section of the website to Gibbsville, WI appliances. You can also look through Gibbsville, WI photos to find examples of rooms with appliances you like, then contact the professional who worked on them.